Kurenai received her orders at family dinner, which was not unusual. Her grandmother, the esteemed matriarch of the Yuuhi clan, had dismissed the youngest grandchildren to play quietly in the garden; one of her aunts was serving tea, while a teenage cousin handed around plates of sweets. Kurenai shared her plate with her little sisters, Akane and Kaede, and hoped the clan council wouldn’t take long. Her feet were beginning to fall asleep. An elderly uncle droned through household accounts. An aunt presented her petition for increasing the amount deducted from the pay of active duty Yuuhi ninja for clan maintenance, and was shouted down by three cousins, all chuunin. Kurenai’s grandmother sipped her tea and frowned down the long hall, and the quarreling cousins quieted. On Kurenai’s other side, seventeen-year-old Kaede went crimson with mortification. Akane perked up gleefully. Kurenai sighed, and passed Kaede the mochi. Assigned to Yuuhi B. until further notice. Report to Shibata T. daily. Don’t worry about making up the hours, Yuuhi. You can count it against your overtime. She’d met Katsuko for drinks a few days ago—deprived of her team and restricted in her physical training, Katsuko had apparently fallen back on her favorite pastimes of long naps, sketching, and badgering friends into buying her food. They’d kept the conversation deliberately light, a welcome respite from daily concerns. Katsuko hadn’t mentioned her captain, and Kurenai hadn’t pressed. She’d wondered, but she’d had other issues to occupy her time. And now, apparently, he was one of them. Again. At least, Kurenai thought with grim amusement, her grandmother wouldn’t try to marry her off this time. Yuuhi Benihime’s workroom had been a tea pavilion, once, set at a deliberate distance from the rambling main house and surrounded by the careful austerity of the garden. One of the uncles, one-armed after the war, kept up the grounds with the help of whatever cousins he could dragoon into pulling weeds or raking gravel. Kurenai picked a handful of green maple leaves on her way up the winding path, and tucked them into her uniform pocket. Her grandmother was waiting on the porch, severe and impeccable as always in her black silk kimono. “He’s early,” she said, without preamble. Kurenai looked back, following her grandmother’s straight crimson gaze. The path twisted through maple and bamboo groves on its way up the hill, paved with irregular stepping stones and arching bridges over a thin silver stream and its fishponds. Halfway down the hill, shrouded by green bamboo, a tall man in jounin blues stood still as the stone lantern beside him. “I didn’t pass him on the way up,” Kurenai observed. “Grandmother, his prior experiences with genjutsu…” Kurenai hesitated. The garden maze was the bane of every Yuuhi childhood. How many times had she wandered, lost and frightened, in that bamboo wilderness before her father came to wake her, or her grandmother relented? Raidou was no five-year-old child, to be bewildered to tears, but the last time he’d been caught in a genjutsu, Tsurugahama Port had suffered for it. “You think he’ll try to smash my skull?” Benihime asked dryly. And Raidou could shake the nightmares free in his own home, instead of her workshop. Well, it was a better offer than Kurenai and her sisters had been given. “Agreed,” Kurenai said. She focused her chakra to a thread, slipping it into the tender veins of the leaf in her hand, twisting through the filaments of her grandmother’s chakra that wound through every tree in this garden. A brief flash of heat, and puff of smoke, and only ashes dusted in her palm. In the bamboo grove below, Namiashi Raidou started, nearly tripped on the rough paving stones, and looked up the hill. Which melted like an ending dream. He did not, miraculously, fall on his face, but it was a near thing. The pathway was still in front of him. The clearing was gone. Bamboo waved in the breeze. The world looked exactly as real as it had a half-second ago, except for how the landscape had altered. A tight, hot shiver clenched his stomach. Genjutsu. He should have expected that. Obviously he should have expected that. He’d just assumed he’d actually get to meet the Crimson Eye of Konoha before she turned his brain inside out. In retrospect, he was probably lucky it had just been trees. He set his shoulders back and finished his trek — much shorter now — to the two women waiting on the porch. At first glance, Yuuhi Benihime could have been the matriarch to any old-blood clan. Iron-grey hair drawn back into a severe bun; a slight frame clothed in the traditional kimono, obi, and zori. She leaned on a dark wooden stick, which had been carved with a deliberate curve twisting down the shaft, like a polished root. Since it was a poor ninja who stopped at the first glance, Raidou took a second, noting details. Her bun was studded with lethal wooden kanzashi, unadorned by flowers or ornaments. The kimono was black watered-silk, swirling with complex, unsettling patterns. Her obi and collar were crimson, the same color as Kurenai’s lipstick. The same color as both their eyes — fresh, arterial red. An edge of something fine and steely glimmered around her, like a warning: tread carefully. At Benihime’s side, Kurenai stood almost half a head taller, wearing the same Intel-styled uniform he’d last seen her in. Her hair tumbled loose and dark around her shoulders. The family resemblance was obvious. Proud, classical bones and pale skin. What was young beauty on Kurenai had become elegant, weathered poise in her grandmother. Benihime looked like she might be approaching sixty; Raidou knew she was on the north side of eighty. He bowed deeply. “Thank you for seeing me, Yuuhi-sama,” he said, trying for calm and polite. Looking down at the leaf-strewn ground it occurred to him, belatedly, that this could still be a genjutsu. He’d never done his own kai. If he started questioning everything, he’d never stop. And that way led to panic, which was a short, ugly trip back to broken ocean towns. He had to start with a seedling of faith, until Benihime — or sense — told him otherwise. She turned, slipped gracefully out of her zori, and slid open the door to pad inside the— tea house? The building was a small pavilion, wooden-walled and thatch-roofed. Perhaps converted to a private space for meditation. Or teaching. Raidou unlaced his boots and followed her. Inside was another testament to tradition. Fragrant tatami mats arranged in a square, a raised platform displaying tea-making equipment. Flat cushions, graceful blossom arrangements in fine vases framing a hanging calligraphy scroll. There was no source for interior light; diffused sunlight spilled gently through paper screens. Benihime knelt on the far cushion, laying her stick down at her side. After a brief hesitation, Raidou lowered himself down on one of the remaining cushions, feeling long-limbed and bulky in the intimate space. Kurenai slid the door closed, dimming the outside light, and took her place on the final cushion. Raidou took a moment to compose his answer. It was common shinobi practice to keep your chakra furled beneath your skin for the business of day-to-day living. Especially in a village Konoha’s size, where the busy, uncontrolled energy of civilians could scrape raw on your senses. Some people took it further, turning themselves almost sideways to the world. Kakashi barely glimmered in his sleep. Others, like Katsuko, could only dim themselves with extreme effort. Raidou had never really had to bother. His chakra liked to hold close to his bones, building density until he siphoned it off for jutsu. It actually took a little effort to crack it open purely for the sake of being open. In a genjutsu-master’s presence, it felt rather like offering his throat to sharp teeth. He was reminded of sensitivity drills they’d practiced a lifetime ago in the academy. Stretch your senses. Further. How many people do you feel? Civilian or shinobi? That was when they’d first starting weeding out the few who could specialize as sensors, capable of detecting a spark more than a mile away. Raidou had very definitely not been one of them, but he could expand himself to the corners of this small space. He breathed out through his nose and opened his hands, releasing energy outwards in a steadily increasing radius. The trick was to keep enough chakra inside the bubble, or you’d just end up with a skin that could only detect what its exterior touched. Against that inner sense, Kurenai glowed like soft fire. Her shape was undefined and smudgy, but that was more likely Raidou’s issue than hers. She put him in mind of a lantern, heat trapped under glass. The harder he focused, the more she slipped away. By contrast, Benihime was a beacon. Blazing, brilliant, and entirely controlled. Corralled in that tiny frame was the immovable strength of a mountain range. Raidou’s breath caught. Behime gazed thoughtfully at a corner of the room, as if she could actually see the ebb and flow of his chakra. She nodded to Kurenai, who rose and walked a slow circuit around the platform, inside the margins of Raidou’s chakra. He watched her curiously. Her chakra rippled, like a tickle on the inside of his ribs. He thought, maybe, he could feel where his own energy bent and moved to accommodate her, but like all things chakra sense-related, the feeling was vague. He was almost relaxed when Kurenai paused, tilted her head, and flared her chakra like an oil lamp exploding. Raidou flinched, strangled a yelp, and scrambled to hold his chakra circle together. It shied raggedly away from Kurenai, losing integrity to become a brief, chaotic jumble before he could control it again. The exchange only took a fraction of a second, but unhappy shivers remained. He added more energy to steady his chakra, smoothing and strengthening it against further sucker punches. “Hmm. That’s enough,” Benihime said. Kurenai returned to her cushion, flashing a brief, apologetic smile at Raidou. There was a lilt to it that made him think he wasn’t the first she’d thumped in a tender spot. He withdrew his chakra, relieved to have it settle back into its usual, comfortable channels, and attended when Benihime spoke again. He thought about telling Benihime that he’d read Sugita and Ninomiya, along with just about every non-classified genjutsu text he could get his hands on. I’m not stupid, dammit. But he doubted that would impress her. More likely she’d just ask why he hadn’t figured out the problem himself. He wondered, briefly, if this was how Ryouma felt when his literacy came under fire. Still, something almost like approval crossed Benihime’s stern face, just for a second. “Now look for the difference in Kurenai’s,” she instructed. Kurenai extended her chakra. It spread and filled the room as Raidou’s had, a gentle ripple that made his skin tingle, but instead of sliding around him, leaving room, it slipped over him, a subtle pressure that pressed against his skin, almost sliding under the surface. He gave her a wide-eyed look. Kurenai’s crimson mouth twitched, hiding a smile. She withdrew her chakra. “He wouldn’t have, if they’d been Yuuhi,” Benihime said, a trifle peevishly. Annoyed that Kurenai had broken her role of silent assistant to speak? Well, if she didn’t want opinions, she should have asked for Kaede. Any Yuuhi grandchild, challenging so defiantly, would have been bound up in genjutsu before their next breath. Kurenai half-expected to see the weave of chakra settling over Raidou, glazing his dark eyes as it took hold. But perhaps ANBU captains merited more tolerance than granddaughters, because Benihime merely smiled at him. 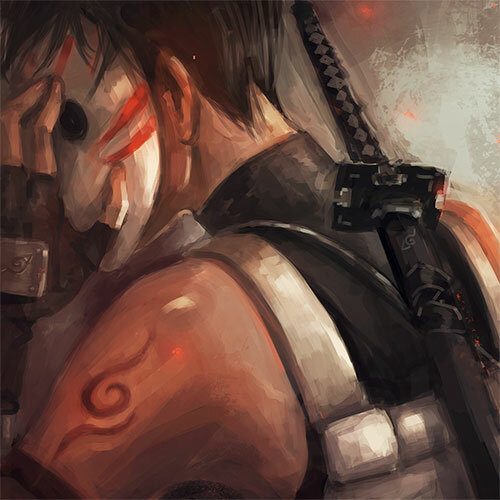 Her smile had edges to it, but he was ANBU. He was used to those. Her hands folded in her lap. Her eyes hooded. The weathered lines of her face settled into a remote, meditative stillness Kurenai knew well. There would be nothing more, until Benihime was ready. Well, at least she hadn’t banished them to the garden to wait. And Raidou’s mouth was tight, but his temper was leashed, for now. Kurenai caught his gaze. He grimaced at her. Aunt Taeko must have come this morning to prepare the utensils; all was laid out in perfect order, from the stoneware jar filled with clean, fresh water to the lacquerware natsume with its loose mound of powdered green tea. Kurenai poured water into the iron kettle, wiped bowls and the tea scoop with a linen cloth, and watched her grandmother. At the very least, he could learn to disrupt the genjutsu’s hold on his chakra coils without actually stabbing himself. Raidou stared at her for a long moment. Silence drew out, thin and brittle; a muscle clenched in the side of his jaw. His eyes were very dark. Brilliant, certainly, but that wasn’t what Raidou was waiting to hear. He didn’t know where the cutting edge of genjutsu research lay, and likely he didn’t care. He wanted a solution to his problem. He’d probably just expected it to come in the convoluted trappings of arcane mysticism, rather than with the stark perfection of a master’s tea bowl. And it was perfect. Exquisitely tailored to his chakra type, his unique strengths, his particular weaknesses—Kurenai’s mind raced ahead, imagining the shield erected at the beginning of a mission into hostile territory, spun out of and anchored into that dense mass of chakra, then half-forgotten until the moment of need… It would work. Of course it would work! For all that Benihime claimed she couldn’t devise a lesson plan in ten minutes, she had one assembled in record time. It involved more sitting. At her direction, he closed his eyes, picked a breathing pattern, and spent the rest of the morning layering his chakra over his skin in varying thicknesses until she finally deemed one acceptable. “I see you’ll have it well in hand,” Benihime said calmly. And that, apparently, was that. A little nonplussed, Raidou bowed, expressed his thanks — Benihime waved them away with a sniff — and let Kurenai herd him out, grabbing his boots on the way. It felt extremely strange to move in a chakra-shield, as if his skin was both hypersensitive and padded in cotton wool. The layer was barely thicker than an oil droplet, but it was everywhere. He’d never been so aware of the back of his knees. His clothes felt cloying. Getting his boots re-laced was a fumble-fingered challenge, but he managed without losing hold of his chakra or tripping down the porch step. Kurenai slipped rather more gracefully into her heels. “The day is still young.” One path seemed as good as any other; he picked a paved trail that wound around the other side of the hill, away from the lantern. Kurenai followed, heels clicking on the flagstones. They completed two circuits at a leisurely pace, Raidou silent, Kurenai serene. By the third turn, sweat had started to prickle at his temples. Perhaps ‘hours’ had been an exaggeration. She stooped to scoop a handful of loose pebbles off the path, and flicked one accurately between his shoulderblades. The sting was sharp and surprising. Not because she’d thrown the pebble particularly hard, but because his chakra transmitted the tiny strike like a raw nerve. “Ow,” Raidou said, but he kept the shield intact. “Work it like muscle memory, you mea— ow.” The second pebble bounced off his right biceps. As before, it wasn’t a hard throw but it stung like a hornet. Kurenai threw with the barest snap of her fingers, signaling as little as possible. Sure, craft a new technique and replicate the ancient secrets of a notoriously paranoid clan in a few weeks. How hard could that be? “Worth a shot,” he said, on the principle of blind optimism. Raidou was still caught on the mental image of trying to replicate the Hyuuga’s — frankly insane — death twirls in an actual fight. That was a technique that only worked if you could literally see through the back of your own head. Kurenai’s grin flashed by again, and she obliged.